What current theory explains why the tectonic plates move? Subducting plates can sink all the way to the boundary. Earth's layers, listed from LEAST to MOST dense, are . Put the layers of Earth in order from outside layer to inside layer. What is the correct order of Earth's layers? the crust and the asthenosphere. the mantle and the core. mantle, core, & molten material. When dealing with the density of each layer of Earth, put the layers in order from highest density to lowest density? If you somehow dug down to Earth's center, the first two layers you would pass through are the and . 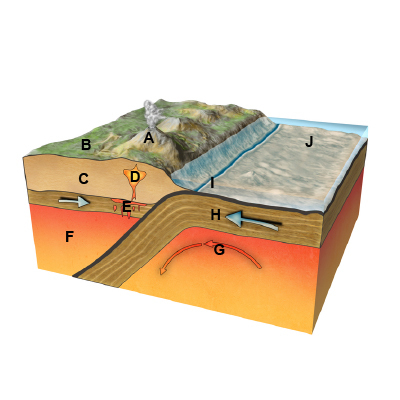 What are the three layers of Earth, from the center to the surface? away from the mantle plume. Which layer of Earth is represented by F? have a mantle that covers the organs. In diagram shown, what does the letter G best represent?